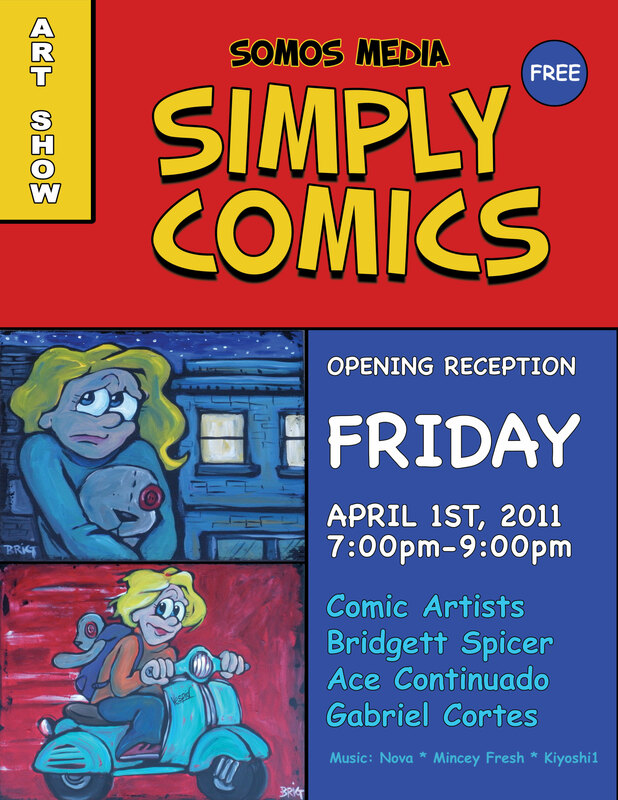 If you’re in the neighborhood you ought to come to Somos this next First Friday. There will be lots of cartoons haning on the walls… new works from yours truly and Harold is rumored to be in attendance (as you can see, he’s IN the art). 430 Salinas Street, Salinas is the place. Wow; FF, Ryan’s departure date, and your SOMOS collaboration all at the same time. Can rational minds handle such a harmonically-converging triumvirate? You know, in the stock market they have triple-witching days also, but those are usually bad. Sadly, I’m not expecting to be in town this go round, but do wish you much (happy, positive) April-Fool tomfoolery. So, does SOMOS actually stand for anything acronym wise? Or is it simply someone’s name? Hey, it could be both. smile. Hey, for the occasion you ought to find yourself one of those funny jester hats. Things usually come in threes. I am also leaving for Sandy Eggo to go to my sister’s bridal shower the very next morning (after the Somos show… which I am uncertain what Somos stands for… I will ask the powers that be). I am, indeed into Silly-ness… thus the silly paintings… Even Randie looking sad has her holding “a stuffed pal for comfort.” How silly is that? More harmonics… wave as you fly over Escondido to Sandy Eggo (You ARE flying, right…that’s a long drive, just ask me!). I’m up that way on occasion but usually too rushed to stop. Much success with Somos display! Thanks Kona… Yes, I am flying… We’re on a tight schedule. Have to be back Sunday night. Sheesh. I will wave… look for me! Sandy Eggo?? Doesn’t sound appetizing. Personally, I like my Eggos plain, or occasionally with some margarine and syrup on ’em. Best of everything with your sis’s shower. Oh, and yes, as a comic artist, I am sure that you’re into silliness. …referred to likely heading and description typo’s. yikes. I added a comment earlier it and it up and disappeared. grumble. OK, let’s give this another shot…. So, I looked up a recipe for Sandy Eggo and, what do you know, it is appetizing. Seems too to be a city going by this name. Do new wonders ever cease? Enjoy the trip, don’t get burned and stay away from those sailboat-of-death rentals like the one in the current news. You know, If I were still a Disc Jockey at a radio station in Salinas, I would be there with bells on. Hope it is a great, and more importantly, a fun show. Lee… would love to have you if you was still around! Bells and everything! I am digging the Sandy Eggo. I love cinnamon! Mmmmm…. maple surple. mmmm. Nice links, Stick. Wish I could make it. Have fun! Don’t let Harold drink too much! Thanks, Dada… and I have already sat Harold down and had the talk. Thank goodness I’m the designated driver.